From the left, senior Ryan Bost, senior Jaheim Holden and sophomore Blake Peters discuss strategy during the fourth quarter. 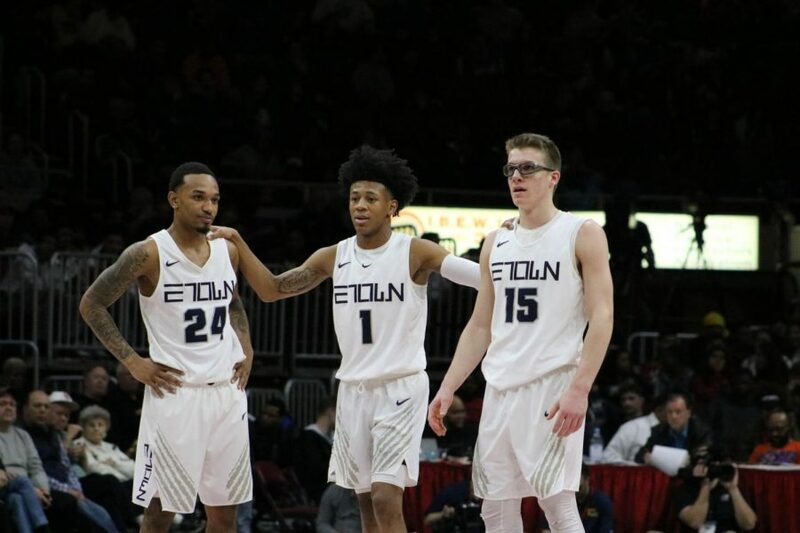 The Kits are shooting to make ETHS history tonight, facing off with Belleville West at 7:15 p.m at the Peoria Civic Center for the class 4A State championship after their semifinal game against the Rockford East E-Rabs last night. 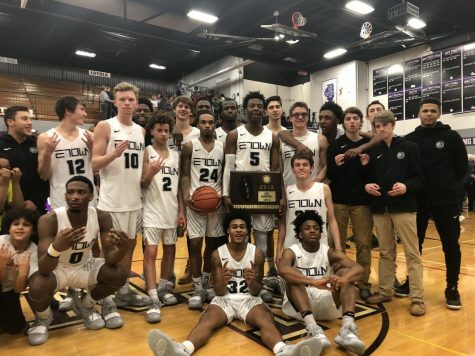 Evanston hasn’t won a state championship in 51 years, their only victory coming in 1968, but hope to change that against the defending champion Maroons. Belleville’s big, skilled team, who defeated CPS powerhouse Curie 70-46 in their semifinal matchup, is heavily favored against a smaller ETHS group, but certain Evanston players have a chip on their shoulder as they feel they’ve been overlooked as true contenders. 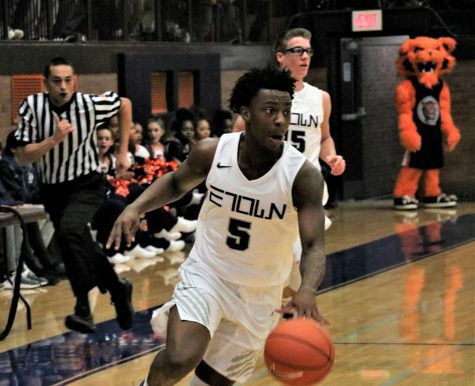 The Kits proved themselves as an offensive juggernaut in their 94-82 victory over the Rockford East E-Rabs in the state semifinal game as ETHS was one point away from tying their season high of 95 points back in December. 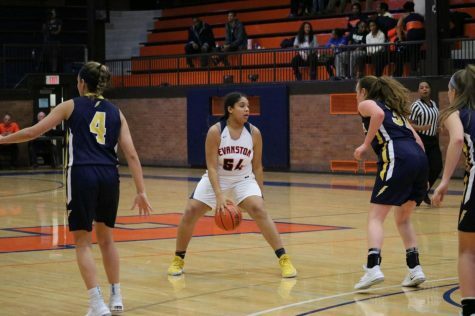 In the fast-paced matchup where Evanston set the class 4A state record for most points in a half and in a game, five Evanston players finished with double digit scoring efforts. Sophomore guard Blake Peters led the way with 27 points, making seven of his eight three-point attempts. 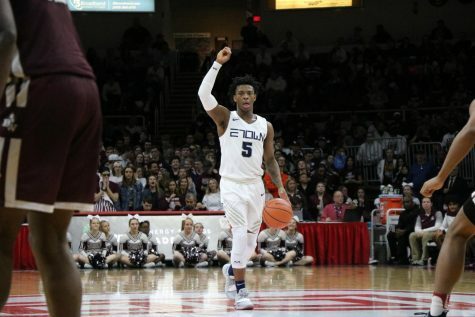 Peters’ strong game was only three points shy of his season-high of 30 and was a near replica of his 23-point performance in last year’s state semifinal loss to Whitney Young. Senior guard Lance Jones added 24 points, shooting an impressive 10-12 from the free throw line after converting just 66 percent of his foul shots this season. Jones also contributed eight assists and five rebounds, a far cry from his 10-point showing in last season’s semi-final. Jaheim Holden contributed 15, and senior guard Ryan Bost and sophomore guard Jaylin Gibson both contributed 10 for Evanston. While virtually everything was going in for the Kits, the usually strong defenders must improve their efforts on that side of the ball tonight. 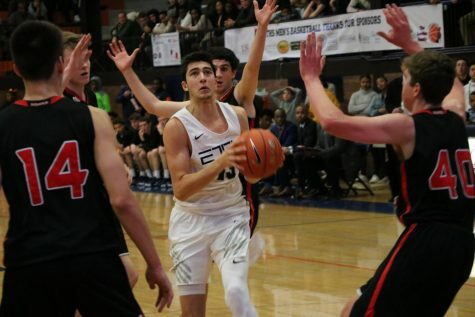 Rockford East scored 82 points, the second largest output by an ETHS opponent all season, while shooting 63 shots, which was 17 more attempts than Evanston who put up only 46 attempts. The Kits allowed a whopping 29 points in the third quarter when the E-Rabs cut a 48-29 halftime deficit to just 68-58. Rebounding will also be an area for improvement emphasized as Rockford snagged ten more rebounds than ETHS. Belleville West’s ‘twin towers’ of E.J Liddel (6’7” 230 lbs.) and Kieth Randolph Jr. (6’5” 250 lbs.) will be a tough challenge for Evanston both in the post and on the glass. Liddel has averaged 20.3 points per game and 9.3 rebounds this season and will play at Ohio State next year as he is viewed as the best senior in the state by many talent evaluators. Randolph Jr. is a persistent physical presence around the basket and is committed to play defensive end for the University of Illinois’ football team next fall. It will be a tall task tonight against Belleville West, but if the Kits can somehow contain the Maroon’s interior players, they could be heading home as state champions.